The ISOMETER® monitors the insulation resistance between the active HV components of an electrical drive system (Un = DC 0 V…600 V) and the reference ground (chassis ground). The patented measurement technology is used to monitor the condition of the insulation on the DC side as well as on the AC motor side of the electrical drive system. The ISOMETER® is assembled with three connectors. 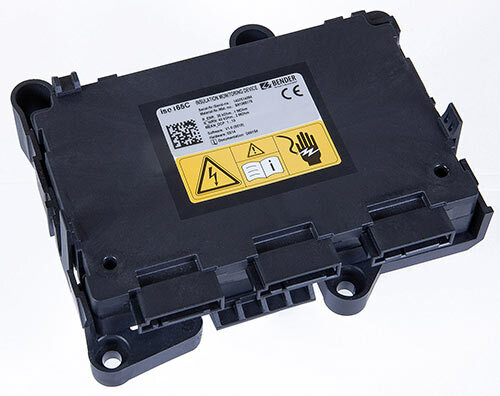 To achieve internal galvanic separation, connector 1 is connected to low-voltage (LV) areas and connectors 2 and 3 are connected to the HV areas in the car environment. automotive requirements with regard to environmental conditions (e.g. temperatures and vibration, EMC). The ISOMETER® CAN bus interface allows it to integrate seamlessly into an existing CAN environment.